To his surprise and horror, Al is revealed to be rank zero, the lowest of the low. He's now not only an outcast - he's also a danger to his entire family. So Al goes on the run, fleeing the brutal Cullers, men who hunt down zeroes . . . and put them to death. Cast out of his home, cut off from his friends, and armed with only a sword and his wits, Al is reduced to just surviving. As he meets other outcasts, however, he begins to suspect that he is a pawn in a larger game - and that he might have the power to tip the scales in a high-stakes struggle between man and dragon. Not only does Dragon Run have a great cover, but it also was a great story. Patrick Matthews has created a fun, exciting, action packed story that is full of relatable and realistic characters. Truly a book I’d recommend to anyone looking for a good read. As mentioned Dragon Run is full of action. It has sword fights, daring escapes from killers, and fire breathing dragons. The story though is what really hooked me and kept me glued to the pages. Dragon Run is fast paced, explains itself, so reader’s are not left with gaping holes in the story, and just plain well written. I really enjoyed every page and couldn’t wait to see what happened next to Al, Trillia, Bird, and Wisp. This is book is great for readers of all ages. Of course, what made Dragon Run such a great book in my opinion were the characters. Matthews does an amazing job creating a group of characters (especially the protagonist Al) who show real emotions in a way that readers will be able to commiserate with the lots fate has thrown at them. Not only that, but while these 12 year olds do make a big difference (they being the protagonists and all) it wasn’t completely out of the blue. The fulfilled plans that had been in place for generations. Al’s sword fighting ability was good, but not extraordinary, his escapes from a dungeon, the Cullers, and the magistrate were all because of the help of others. Basically what I’m saying is while Al does turn the tide, everything that takes place in the book makes sense and is realistic. Society is not changed forever because one boy decided to make it so in a matter of days. Even Al’s escape and exile lasted weeks on end, and none of it could have been achieved if not for the help of others. Further, none of the characters emotions are fake. Readers will be able to see the shift from shock, to acceptance, to anger, to resentment, to determination, and all of the changes will make sense. All in all, Dragon Run is a fantastic book. 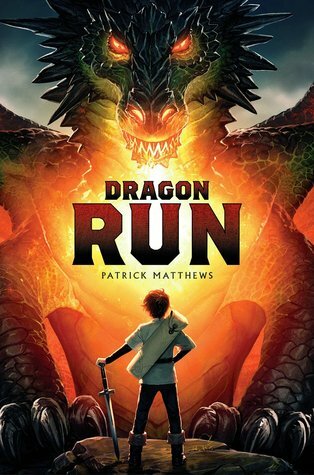 I have no problem recommending it to anyone who enjoys fantasy or YA and can’t wait to read more books by Patrick Matthews, especially if it includes further adventures with Al, Trillia, Wisp, and Bird. I just added a quiz to the book's web site that you might be interested in. The idea is to answer six little questions and find out where you'd fit in as a character in the book.